Westside dim sum lovers rejoice! You need not drive all the way out to the San Gabriel Valley and wait an hour to eat dim sum. With the reopening of Empress Pavilion in Chinatown, you can eat dim sum and have extra hours to spend at your leisure. Back in its peak, Empress Pavilion was a mob scene on the weekends. Hour long waits were not unusual, and sometimes by the time you managed to be seated, there were very few carts, and thusly not much dim sum to choose. 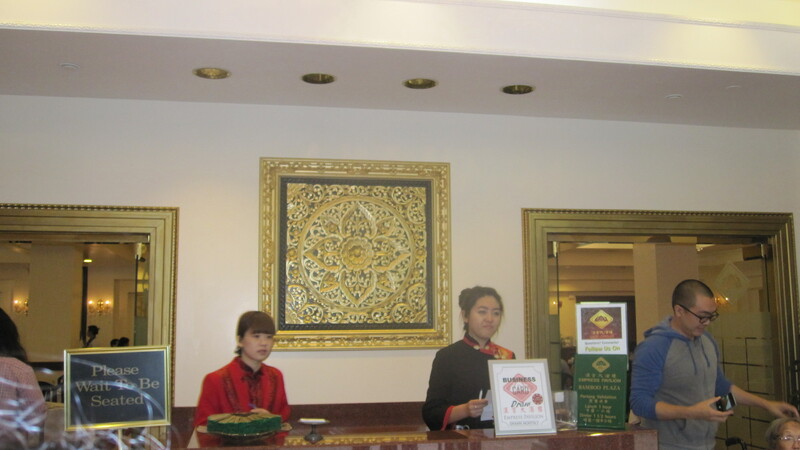 When Empress Pavilion closed several years ago, you had to spend the extra time driving in your car to the SGV and then wait an hour (unless you got there right when the restaurant opened) to eat dim sum. When Empress Pavilion reopened, we eagerly waited for reviews to see if it was up to the original. Finally, Jonathan Gold gave it his blessing in his Los Angeles Times review, so we made the trek to Chinatown. We arrived a little on the late side (1:45PM) and were quickly seated. The cavernous dining room was only half-full, but there were several carts snaking their way through the room. This was in great contrast to the past when at 2PM there seemed to be nothing but carts with chicken feet and tripe left. The first cart to hit our table had a variety of steamed dumplings so we ordered three. I had to pass on getting har gow since we had already three other dumplings filled with shrimp. The dumplings were more delicate than some of the SGV restaurants where the dumpling skin can barely contain the shrimp fillings from bursting out of the skin. Soon more carts quickly followed, I couldn’t tell if there were more carts than in the past or if there just seemed like more because the dining room wasn’t that full. At any rate, our table was overflowing in just a few minutes. The Roasted BBQ Pork was delicious – not too fatty, not burnt. The slices were tender, juicy and very flavorful, My daughter could have eaten the entire plate (as could I). I assume the same pork was used in the Baked Pork Buns which were probably just as delicious. I don’t really know because my daughter ate all of the buns (though she could have done without the sesame seeds on top – a strange touch). My daughter plowed through a plate of Rice Noodles with Shrimp. By that time, she was too full to eat the Steamed Shanghai Dumplings and wasn’t able to give a full report as to how they compared to other places. I did eat them the next day reheated, but they never taste anywhere as good as they do when fresh. We also got siu mai. They were decent, but not as good as some of the places in SGV. Empress Pavilion lacks some of the more innovative dim sum dishes that you see in the SGV, but that’s OK with us as we like to stick to the classics. We got a plate of veggies. Dim sum is so protein-heavy so it helps to have some veggies in your system as well. We ate all this and were done in 15 minutes, easy. It was the fastest dim sum meal I’ve ever eaten. Empress Pavilion validates for parking in the building as well. Eating dim sum here is so easy in comparison to the ordeal it can be in the SGV. When you have a family of dim sum lovers like I do, it’s good to have Empress Pavilion back! As of December 2015, Empress Pavilion has ceased regular lunch and dinner service is now only available for special events.